In the center of the image above is an orange smudge. It may not look like much to the untrained eye, but to NASA it represents potential. It’s a candidate asteroid target for a mission the agency badly wants to happen, even though nobody knows for sure yet if things will line up for humans to visit there one day. This is a picture of asteroid 2011 MD taken by NASA’s Spitzer Space Telescope. It’s about 6 meters (20 feet) across and appears to have a low density, the agency said in a statement. While NASA is still looking for other candidates for its asteroid initiative, the agency added this would be the sort of asteroid it’s looking to visit. “The asteroid appears to have a structure perhaps resembling a pile of rocks, or a ‘rubble pile.’Since solid rock is about three times as dense as water, this suggests about two-thirds of the asteroid must be empty space,” NASA stated in this press release. You can read more about this asteroid in Astrophysical Journal Letters. There was another study done on 2011 MD earlier this year that was also in ApJL, or in preprint version in Arxiv. Announcing this asteroid candidate was just one of several things NASA made public today. It added that it plans to send off an ARM (Asteroid Redirect Mission) robotic spacecraft in 2019, and about one year before that it will decide which asteroid to send this spacecraft to. NASA has two concept ideas for ARM, and it’s planning to award $4.9 million (it had initially planned for up to $6 million) for others to make more detailed investigations into which is the more feasible. Read the full list of recipients at this NASA website. 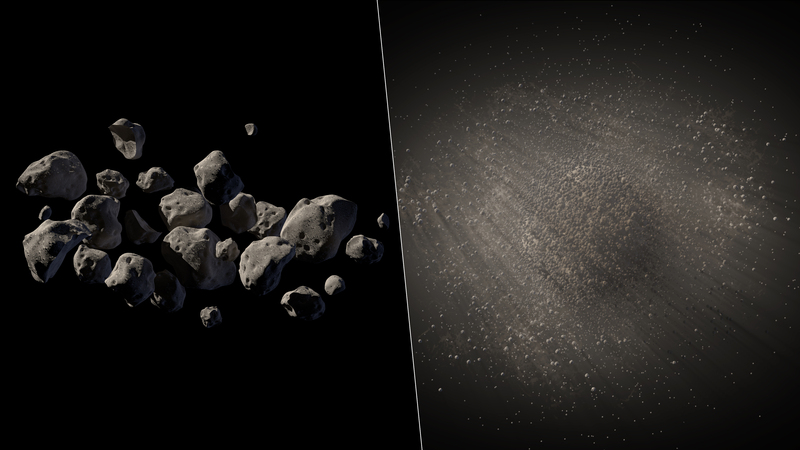 One idea is to pick up a small asteroid, and the other is to carve off a small portion of a bigger asteroid. Whatever the choice, it would involve coming up with an object that is less than 32 feet (10 meters) across to move to the moon’s orbit. NASA will decide what to do later this year. “The studies will be completed over a six-month period beginning in July, during which time system concepts and key technologies needed for ARM will be refined and matured. The studies also will include an assessment of the feasibility of potential commercial partners to support the robotic mission,” NASA stated. Also, some more details about other candidates: NASA has found nine so far that it deems suitable, and size estimates have been made on three of those nine candidates. A fourth, 2008 HU4, will be close to Earth in 2016 and allow for “interplanetary radar” to learn more about its size and rotation, NASA said. The other ones will not get close enough to Earth for a better look before the mission selection is done. NASA added that it expects to add more through its Near-Earth Object program, as one to two asteroids get close enough to our planet every year for analysis. Further, the agency hopes to learn more about asteroid makeup through its planned Origins-Spectral Interpretation-Resource Identification-Security-Regolith Explorer (OSIRIS-REx) mission, which is on its way to asteroid Bennu in 2018 after a launch in 2016. All of this, of course, is dependent on NASA’s budgetary situation for the years to come, which in turn depends on support in Congress.